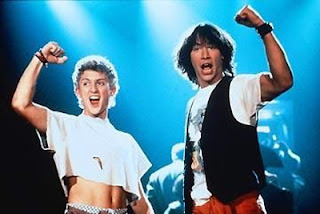 It's official: a Bill & Ted 3 movie is in the works! Actor/director Alex Winter – aka Bill S. Preston Esq. spilled the beans when speaking to Yahoo UK recently. "[Bill & Ted] will be 40-something and it’s all about Bill and Ted grown up, or not grown up,” Winter said. “It’s really sweet and really f*****g funny. Winter, Reeves, Matheson and Solomon took their time crafting the film's central premise, but they arrived at a satisfactory story "about four years ago." The problem, Winter says, is that news of the project hit the media and now fans have to "get dragged through this long, boring, protracted process" of the movie's development, which "just takes a long time." "It took time to construct the idea," Winter says. "It took Chris and Ed time to build the first draft. Then we put a producer together and got a director [Galaxy Quest's Dean Parisot]. We’ve been working on drafts for the last couple of years. The script’s been finished for a while, but comedy is so specific. We’re in that world where producers are on, financiers are on and we’re just working and reworking the script."